Emma will sing during the Hay on Wye World War One Commemoration Weekend. 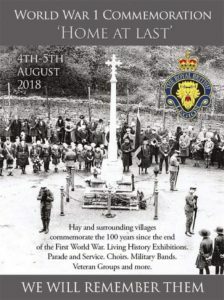 This is the culmination of a series of commemorations which have taken place since 2014 organised by the Royal British Legion for Hay and the surrounding towns and villages. The weekend will include living history exhibitions, military bands, veterans groups, and parades. Emma will sing during the remembrance service with the Surrey Police Band, the Swansea City Pipe Band, and Talgarth Male Choir, Wern Fach Choir, and Rhayader Voices in Unity. One hundred red roses will be laid in memory of the fallen. There will be a performance of a new song, “Home at Last,” composed especially for the occasion by John Rees and arranged by musical director Graham Atterbury. 4thand 5thAugust, Hay on Wye, Wales.